Mike Everitt left his Opening Day assignment about halfway through what would turn out to be an eventful marathon game, suffering a concussion on a pitch that struck his facemask directly. 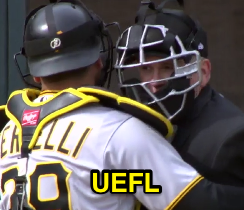 In the bottom of the 8th inning of Friday's Pirates-Tigers game, Pirates pitcher George Kontos' 1-0 86.5-mph cutter eluded catcher Francisco Cervelli's reach, instead making first contact with the center portion of Everitt's traditional-style facemask and resulting in Everitt's removal from play. Following the game, reports surfaced that Everitt had been diagnosed with concussion. 2B Umpire Tony Randazzo replaced Everitt behind home plate, while 1B Umpire Bill Welke and 3B Umpire Lance Barrett split the field umpires' duties. Welke additionally assumed the role of acting crew chief for the game's remainder, which became relevant in the 10th inning. Related Post: MLB Ejection 002 - Bill Welke (1; Ron Gardenhire) (3/30/18). Relevant Injury History: There is no recent relevant (e.g., cranial) injury history.